State orders owners of newly-banned, unregistered firearms to turn them all in. 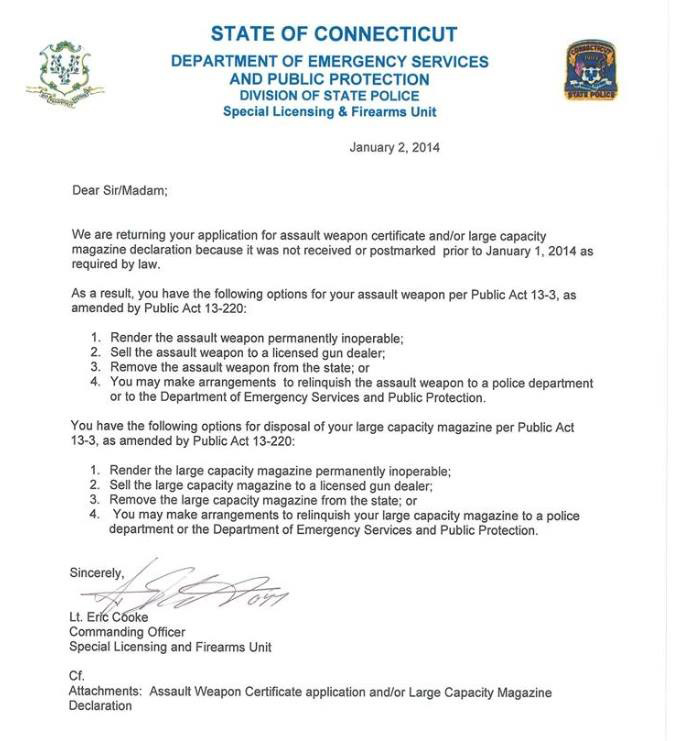 “We are returning your application for [an] assault rifle certificate and/or [a] large capacity magazine declaration because it was not received or postmarked prior to January 1, 2014 as required by law,” the notice states. The letter breaks down the gun owner’s “options,” including surrendering their firearms and magazines to the police, selling them to a gun dealer, removing them from the state or rendering them inoperable. Because these owners attempted to register their guns and accessories, the state can now prosecute them at will because they know exactly who they are. But when it comes to the vast majority of gun owners who did not register at all, Connecticut lacks clout. Last month it was revealed that out of the over 2.4 million high-capacity magazines in Connecticut, only 38,000 have been registered. Likewise, only 50,000 semiautomatic rifles were also registered, further proof that Connecticut’s gun owners are revolting through civil disobedience. These gun owners correctly realize that registration only leads to confiscation and that the overall agenda of gun control is to completely ban private gun ownership. Last year, the New York Police Department began confiscating guns which were previously registered but are now banned under New York’s newest gun control law. The NYPD knew exactly which gun owners to target by using the city’s centralized firearms registry which was already in place. Connecticut’s anti-gun politicians want their own registry so they can eventually confiscate firearms in the exact same manner.